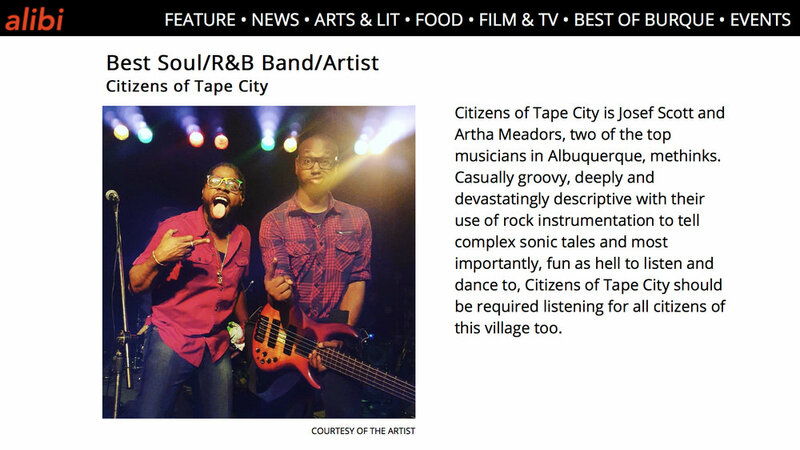 Citizens Of Tape City is an amalgamation of elements of R&B, Funk, Progressive Rock, and Pop. It is the collaborative efforts of Josef Scott (Vocals), Artha Meadors (Bass/Guitar/Programming), and Chris Gadson (Drums). The goal of COTC is to make music that is unapologetically their own, combining musical backgrounds in to something that is hard to define but still recognized as exceptional. Using the theme of a fictional city, COTC is able to invoke the various backgrounds and experiences of the people of that city as templates for eclectic and diverse songs and styling. 2017 marks the release of COTC’s first studio production, The “She Like Me EP”. 2018 will give the addition of a full-length album “Save The Rec”. Recommended if you like: Bad Rabbits, Circa Survive, Miguel, N.E.R.D., Deftones, Frank Ocean and Mint Condition.